When I started with chickens, I asked Mike (an Australian chicken expert with 26 years experience) about how to protect chickens from different weather conditions. I later quoted him in an article as saying...in Mike's area of Australia, "it rarely gets cold, so Australians don't have to worry about protecting their chickens from severe weather. What a luxury we don't have in the U.S."
Australia is an entire continent (of course). It has weather as varied as most that we get in America. But you know, it takes a real ding-a-ling to screw something like that up for over a year. To help satisfy my bone-headedness, (just in case you live somewhere that has various temperatures and weather conditions) - chickens can survive in relative comfort down to about freezing (or 32* Farenheit, 0* Celsius) - As long as they have protection from the elements. Below that temperature you probably need to provide supplemental heat. More importantly, over-heating is a much bigger concern. So make sure your chooks have plenty of water, air-flow (ventillation), and shade when it's hot out. 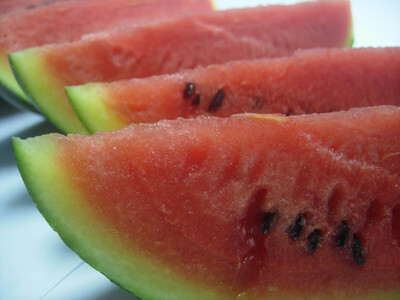 Fruit such as melon straight from the fridge can make a nice cooling treat on a hot summers day.